Long chain fatty acids are important for babies too. 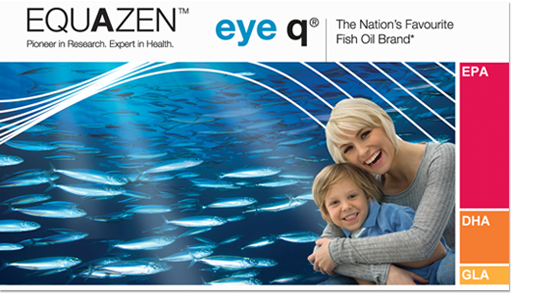 Equazen eye q baby brings you the specific Omega-3 and Omega -6 essential fatty acids that have been shown to be important for a baby's healthy growth. We know that up to 30% of the dry weight of the brain and eye is made up of long chain fatty acids, the majority being Omega-3 DHA (docosahexaenoic acid), and to a lesser degree Omega-6. We know that up to 30% of the dry weight of the brain and eye is made up of long chain fatty acids, the majority being Omega-3 DHA (docosahexaenoic acid), and to a lesser degree Omega-6 and that these nutrients can only be supplied from the diet. So it is particularly important that they’re in constant supply during the first two years of a child's life, when brain development is most rapid. A developing baby will receive essential fatty acids through its mother’s placenta during pregnancy, and hopefully these nutritional inputs will be maintained during breastfeeding, as essential fatty acids are key active components of a mother's breast milk. To help safeguard dietary intake during breastfeeding we recommend mothers supplementing withmumomega. A young infant’s brain continues growing rapidly until they are approximately two years old, therefore Omega-3 DHA (docosahexaenoic acid) and Omega-6 AA (arachidonic acid) are still important after breastfeeding has stopped. The formulation is similar to the capsules of its parent product, mumomega, but the essential fatty acids in Equazen eye q baby are delivered in simple Twist-Off capsules. So all you have to do is twist off the tip and squeeze the contents into any food and drink. The product is suitable for babies of 6months to 3 years old. Hi-DHA fish oil, capsule shell (gelatin, glycerol), virgin Evening Primrose Oil, Vitamin E (as D-alpha tocopherol, from IP soya). Natural Vitamin E 1.4mg ° TE+1 EU recommended daily allowance. 3 EU recommended daily allowance: 14% RDA. +°TE = d-alpha tocopherol. Natural Vitamin E	1.4mg ° TE+1 EU recommended daily allowance.